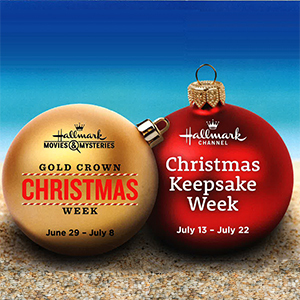 Just like stores have Christmas in July sales, Hallmark Channel and Hallmark Movies & Mysteries are getting into the action. They’re showing more than a hundred holiday movies in the middle of summer. Each channel is showing Christmas movies for a so-called week (although technically it’s more like two weeks). Read on to find out which channel is playing what. Starting June 29, you’ll find at least three movies every weekday evening, and at least 10 every weekend day. In fact, by my count, there are 57 different movies you can watch! Rocky Mountain Christmas with the charming Lindy Booth. Christmas Encore. I liked the set-up and the leads had a nice chemistry. Magical Christmas Ornaments. It’s a total shameless plug for Hallmark ornaments, and I expected to hate it, but I found myself charmed. If you like country music and/or Becca Tobin (of Glee fame), be sure to check out A Song For Christmas even though I found it to be extra predictable (which yes, for a Hallmark movie, is saying something). I missed Romance at Reindeer Lodge last year, so I plan on setting the DVR so I can watch it now. Staring on July 13 and ending July 22nd, Hallmark Channel promises to play your holiday favorites. Here’s the schedule and it includes lots of movies from last year’s Countdown to Christmas. Marry Me at Christmas. Totally predictable and yet the stars made it work. One of my favs of last year’s batch of movies. The Sweetest Christmas. Two words: Lacey Chabert. Coming Home for Christmas. Not a princess movie, and yet was a princess movie (and because Danica McKellar). With Love, Christmas. The office mystery Santa angle was fresh and I thought it worked. And last but not least, Christmas Next Door. Almost too cute, but the cast pulled it off. I am hoping to watch Christmas Getaway is on which I missed, and also maybe Christmas Connection. Full disclosure: I could not bring myself to watch Switched for Christmas last year, and I don’t see that changing—but it’ll be on if you’re interested. Hallmark’s kicking off Christmas programming for 2018 on Oct. 26. Look for 22 new Countdown to Christmas movies on Hallmark Channel and 12 new Miracles of Christmas movies on Hallmark Movies & Mysteries.